Los Angeles-based mixed-game pro Brian Brubaker overcame a field of 326 to win his first World Series of Poker bracelet, topping Event #28: $1,500 Limit 2-7 Lowball Triple Draw for $109,967 in first-place prize money. 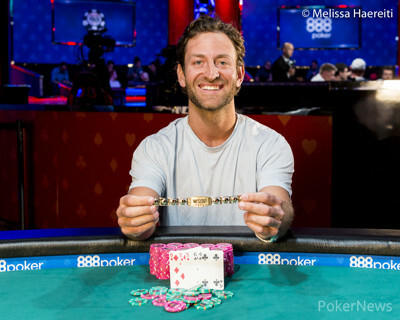 Out of a final table that lasted roughly five hours, about two of those were devoted to heads-up play between Brubaker and start-of-day leader Brendan Taylor, who won a bracelet in a limit hold'em shootout event back in 2010 and was seeking his second piece of gold. "It was a lot of fun. 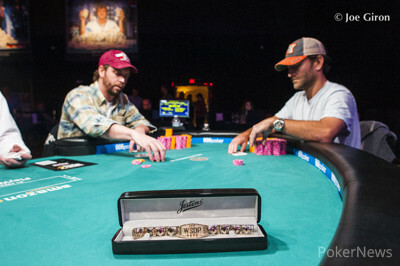 Pretty intense, there were a lot of swings throughout the final table," Brubaker said. "Luckily, I pretty much just won the majority of the [heads-up] pots and went straight up." Just getting there took some work, as Brubaker had to overcome some tilt that was completely unrelated to poker. He came into the day on short sleep after an especially irritating night just looking for somewhere to sleep. 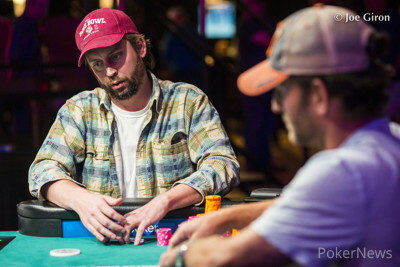 Brubaker had a room booked until the start of Day 2 of this event, when he checked out with the plan of simply finding a place to crash if he advanced to the final table. Turns out, that was easier said than done with Electric Daisy Carnival in town. The famed music-and-dance festival had hotels throughout Las Vegas packed to the brim. "I finally found a room at Cosmo, but it was like the eighth place I called," Brubaker said. "It was 3:30 in the morning and I was tilted for not being able to go to sleep before the final table." Nonetheless, Brubaker persevered through those first-world problems. Short stacks Rick Fuller and Dean Kerl fell early at the final table, and they were followed by one of the biggest stars in the event, though not one necessarily known to poker fans. German soccer star Max Kruse, who often takes breaks from filling up nets in front of tens of thousands to fire a few events at the WSOP every year, made his way to the final table. He seems to be particularly adept at draw games, having finished third in a 2-7 single draw event in here in 2014. Kruse had the loudest — and most heavily drinking — rail, but the Germans filtered out with him after he fizzled out in fourth. Jason Riesenberg followed in third, and the heads-up battle began. Taylor's high level of aggression had induced some of his opponents to make mistakes that cost themselves bets. Brubaker said he definitely noticed how hard Taylor was pushing, but Brubaker didn't let it faze him or make too many adjustments to go outside of his normal game plan. "He's a good player," Brubaker said. "With no antes and just blinds, and I had a comfortable stack today, I didn't need to get involved in every pot. I made some adjustments, but I didn't want to over-adjust and start battling him when I'm second in chips with really rough draws that are just gamble spots." The lead changed hands several times, but with limits relatively large — just 40 bets total were in play by the end — one sustained swing could tilt things heavily in one direction. That sustained swing went Brubaker's way, and Taylor couldn't recover after being hammered down to just a few bets. Brubaker's previous best cash was $70,743 for third place in $2,500 2-7 Triple Draw in 2013. He confirmed he plays a fair amount of draw in his usual haunts. The one-time big-bet player now calls the mixed-game tables in L.A. his office, and he knows what to do when switching to the tournament tables. "I guess I'm pretty good at draw altogether, especially in a tournament," he said. "I make some adjustments in tournaments I think are successful. I don't know if they're necessarily what other people would say are good. "But, I've been successful with it and now I have something to prove it." Brendan Taylor raised and Brian Brubaker called. Both drew two and Brubaker check-called. Both drew one and Brubaker again check-called. They each drew again but this time checked. Brubaker took it with . A few hands later, Taylor raised and Brubaker made it three bets. Taylor called. Brubaker took two and Taylor three. Brubaker bet, Taylor raised, and they got Taylor's 65,000 in there. Brubaker was pat on both final draws, while Taylor took one, mucked it, and took another. Brubaker rolled over . Taylor had a draw plenty good enough to beat that with . He peeled his card slightly. "Three across diamond," he said. "Should be good." It was the though, pairing him and locking up the tournament for Brubaker. Brian Brubaker has Brendan Taylor down to under 400,000 after he took down a pot after the third draw. Brubaker raised predraw and Taylor called. Both players drew three and Taylor checked. Brubaker bet and Taylor called. Then each player drew one and Taylor check-called another Brubaker bet. Taylor drew one and Brubaker bet. Taylor folded. Brendan Taylor raised and Brian Brubaker called. Brubaker took three and Taylor one, and Brubaker check-called. Brubaker took two and Taylor one, and Brubaker checked again. Taylor bet and this time Brubaker raised. Taylor reraised and Brubaker called. Both patted and Brubaker's was a winner. The final two players in Event #28 have been going back and forth, minus a few stages where one of them slowly builds a lead. Brian Brubaker is the latest to build a bit of a lead and is approaching 2 million. There has been a lot more three-betting pre-draw since coming back from break. On this hand, Brubaker raised and Brendan Taylor three-bet. Brubaker called. Both players drew two and Taylor bet. Brubaker called. Taylor drew one and Brubaker drew two and Taylor bet again. Brubaker called and stood pat behind a one-draw by Taylor. Both players checked and Brubaker won the hand with . Brendan Taylor raised and Brian Brubaker called. Brubaker was ahead in the draw though, taking two while Taylor took three. Brubaker bet out and Taylor called. Brubaker took one and Taylor two and Brubaker fired again. Taylor raised this time though, and Brubaker called. Brubaker took a final card and Taylor patted. They both checked and Taylor won with . There was a steady divide building between Brian Brubaker and Brendan Taylor heading into the break. There wasn't really one hand that stood out, but a series of hands where Brubaker got the majority of the small pots the two played. Brubaker won a hand when he defended the big blind against a Taylor raise. Both players drew two and Brubaker checked. Taylor bet and Brubaker raised. Taylor called. Brubaker stood pat and Taylor drew one. Brubaker bet and Taylor called. Brubaker stood pat again and Taylor drew one. Both players checked and Brubaker won with .